As an avid reader and aspiring author, I always look forward to literary events. They provide a venue for discussion on development and promotion of the appreciation for literature, reading and writing. They contribute to fostering the discourse and shaping the landscape of our contemporary literary scene. One of those is the Philippine Literary Readers and Writers Festival held last August 26 to 28. Presented by National Bookstore and Raffles Makati, it was filled with insightful talks, launches and signings and exhibits from various Filipino literary talents. One of the highlights of the festival was Adam Johnson, Paula McLain and Anna Todd, all internationally acclaimed and bestselling authors. Johnson, the Pulitzer Prize-winning author of The Orphan Master’s Son, shared his fascination with North Korea, which inspired him to write the novel. As among the few individuals in the world who had ever been there, he was able to witness and observe the harrowing realities, like the policy on putting state-controlled loudspeakers in every home, the personality cult, the uniforms issued to citizens, among so many others, that plagued the nation under its dictator. Indeed, his book has presented an eye opener to a situation we may have never known about. New York Times-bestselling author of The Paris Wife, McLain imparted her interest in the ideas of time travelling and preserving moments in time. Her book is a fictionalized account of Ernest Hemingway’s first wife. As a master of historical fiction, she shared that accuracy has a pertinent role in her writings. Listening to the talk of Anna Todd, author of the After book series, was phenomenal. (And so were the fans!) Written as a One Direction fan fiction, her book attracted thousand of readers when it first appeared online through Wattpad, leading to its international print release. Todd’s success story as an author is sensational. Hers is a testament that a master’s degree in writing (or even a college) degree or countless literary fellowships is a prerequisite to being a writer. For her, it was about imagination, a knack for writing and well, Wattpad, which is where she continues to write stories free for reading. Aware that fan fiction is not traditionally considered “literary,” she was quick to respond that we are all writers of fan fiction. And she definitely had a point. Fan fiction is also fiction writing, inspired by real people, places and events. It was also revealed that After is now up for film adaptation, which delighted all the fans. Even though I am not exactly a fan fiction reader (especially that of One Direction, hehe), Anna Todd’s books may just find their way to my reading list. Whenever new books are launched, excitement gets the best of me. Here goes another book added to my ever-growing shelf! 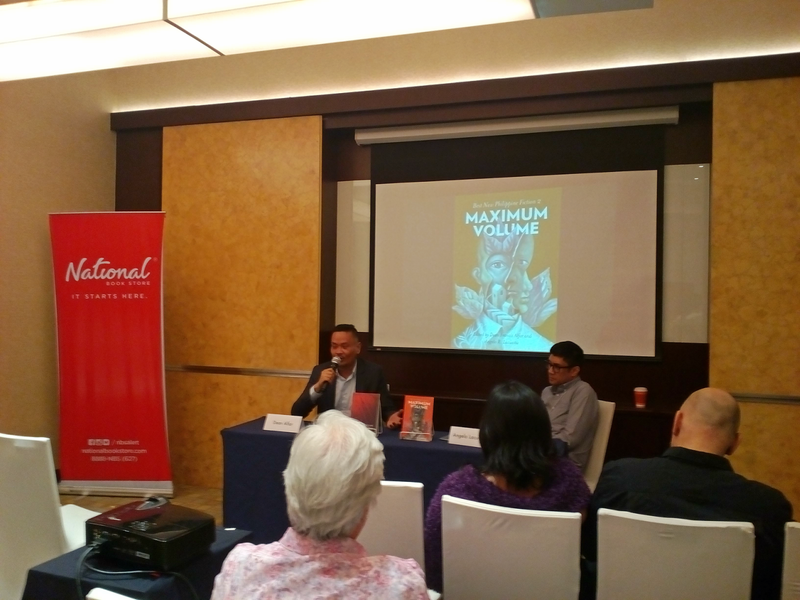 During the festival, Anvil Publishing launched the Maximum Volume: Best New Philippine Fiction 2, edited by Dean Francis Alfar and Sarge Lacuesta. The editors noted that the short story form is still very much relevant and remains to bear a lot of promise. A call for submissions was also announced for its third installment. Visprint also released three books during the event: The Lait Chronicles by John Jack G. Wigley, Instructions on How to Disappear by Gabriela Lee and Wounded Little Gods by Eliza Victoria. Other books that were launched include Sangkatauhan, Sangkahayupan by Alvin Yapan from the Ateneo de Manila University Press, The Big Fat Book of Self-Love by Danah and Stacy Gutierrez from ABS-CBN Publishing and Amazing Facts and Figures Every Filipino Must Know by the popular site FilipiKnow.net from Summit Books. I listened to the timely talk of Susan Quimpo, author of Subversive Lives, and Robert Francis Garcia, author of To Suffer Thy Comrades, entitled “#NeverAgain: The Relevance of Martial Law Today.” I shared their sentiments that many of Filipinos, especially the younger generation, seemed to be oblivious of one of the darkest parts of our history that is the Martial Law period. It was highlighted that the citizen’s participation on the discourse on politics and governance do matter. In “Writing Young Adult Fiction Today: Creating Stories for Diverse and Discriminating Readers,” Mae Coyiuto, author of the epistolary book The Year We Became Invincible, shared her thoughts on writing YA books that suits the real challenges that teenagers experienced, adding that readers are smart enough to understand the harsh realities without all the sugarcoating. Still from the same panel, journalist Ronald Lim, co-editor of Kids These Days, expressed his frustration on the nonexistence of YA books that tackle LGBTQ issues. Romance writer Mina V. Esguerra, on the other hand, shared her thoughts on the kind of stories that readers want to read, including the types of characters and plot of a fulfilling YA read. 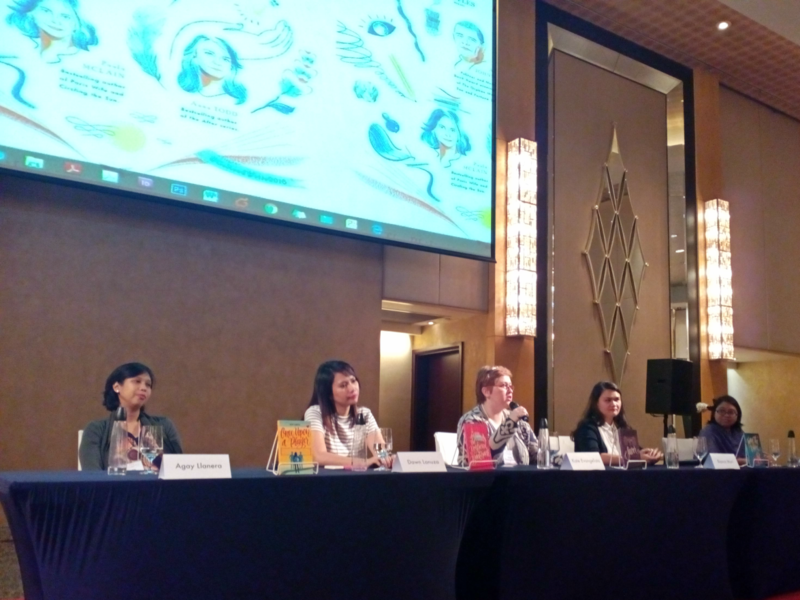 Speaking of romance, I also attended the talk on “In Between: What’s Up with Philippine New Adult Fiction?” Kate Evangelista, Dawn Lanuza, Agay Llanera, Chrissie Peria and Bianca Mori, all authors of Spark Books titles, led a captivating discussion on writing romance books and self-publishing. It was also refreshing to listen to the discussion in “Stranger Than Fiction: How Real Life Shapes Stories.” Ines Bautista-Yao, Quark Henares, Marla Miniano, Reese Lansangan, Chandra Pepino, Abby Orbeta and Roch Lazarte, all authors of YA titles from Summit Books, shared their thoughts on self-expression, coming-of-age and inspiration to channel our inner hugot from a mere experience to a compelling story worth reading. In “The Door to Getting Published: Finding a Home for Your Manuscript,” the tricks of the industry’s trade of becoming an author of children’s books were presented. The panel was moderated by Reni Roxas of Tahanan Books, with panelists Annette Ferrer of CANVAS, Eli Camacho of Adarna House, Joanna Nicholas of OMF Literature and Mari Delfin of Bookmark.. It was a superbly informative talk on what the publishers look for in manuscripts for children. Do you know the #1 thing aspiring authors should do in their submission? Follow the publisher’s submission guidelines, which is, unfortunately, one of the things that most authors overlook. On accomplishing a bestselling book project, Irish Dizon and Pete Rich, author and illustrator, respectively, of Team Real: An All-Access Pass into James Reid & Nadine Lustre’s World, shared their experience in bringing their work to the stands. 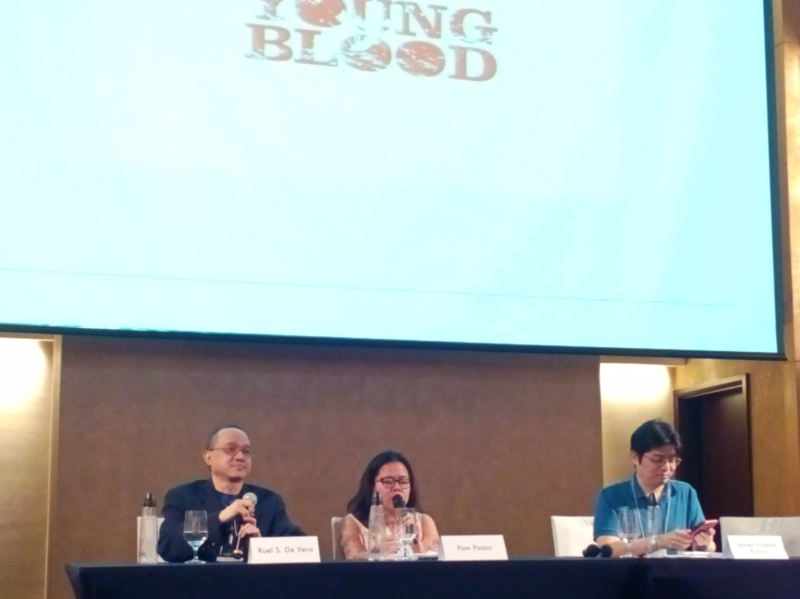 The festival also offered workshops for the participants, and I attended the “Young Blood Workshop,” as moderated by Ruel S. De Vera, with panelists Pam Pastor, Rosario Garcellano and Javier Vicente, who are the people behind the Young Blood series from Inquirer Books. As a regular reader of the popular newspaper column, I was delighted to hear their constructive criticism on essay-writing, especially aimed at 20-somethings and below. 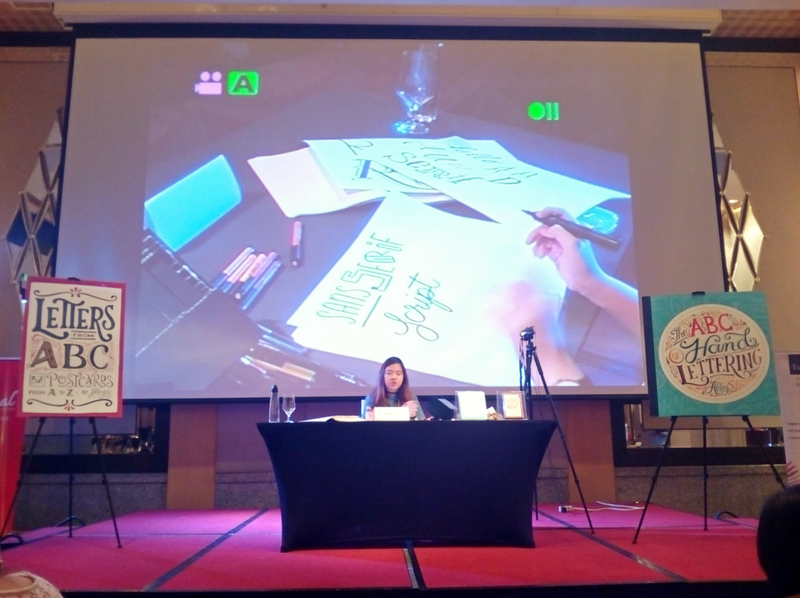 I also participated in the hand lettering workshop led by Abbey Sy, author of The ABCs of Hand Lettering. It was really fun doing all the various strokes and font types in lettering. I realized that lettering is much easier from the traditional calligraphy I used to imitate in high school. In addition to Sy, June Digan, author and artist of A Year of Positivity, also taught water coloring. How I wish I could also make lovely artwork pieces! During the festival, spoken word artist Juan Miguel Severo performed his well-known pieces. He recently released his first book, Habang Wala Pa Sila, which features more of his heart-tugging performances. His second book is up for release in the coming weeks. Even though I frequent bookstores on the regular, I still couldn’t help but browse through the pop-up stores in the event, which featured mostly local titles. Needless to say, it broke my wallet… but made my heart whole.